This page is about the tank destroyer ISU-122. For the version equipped with a D-25S cannon, see ISU-122S. The ISU-122 is a Rank IV Russian tank destroyer with a battle rating of 5.3 (AB) and 5.7 (RB/SB). It was introduced during the Closed Beta Test for Ground Forces before Update 1.41. Good acceleration in reverse allows you to hide quickly. Armour cannot stop most common cannons. When the ISU-152 began production in 1943 with the large 152 mm ML-20S gun, production of the chassis and hull soon exceeded the supply of the ML-20S gun, which caused a decrease in production of self-propelled guns for the Soviet military. It was determined to speed up self-propelled gun production, the ISU chassis were to be mounted with the 122 mm A-19S gun. Work on this mounting already began before the supply issue in December 1943 at the Chelyabinsk Kirov Plant (ChKZ), which had a design team simply take the ISU-152 chassis and hull and only changing out the armament with the 122 mm gun, but this prototype - Object 242 - was not immediately put into production despite successful testings. When the supply issue arose, the prototype was then adopted by the Soviet Defense Committee for increased production and also that the 122 mm gun had better accuracy against tanks than the 152 mm gun. The ISU armed with the 122 mm gun, designated the ISU-122, began production in April 1944. 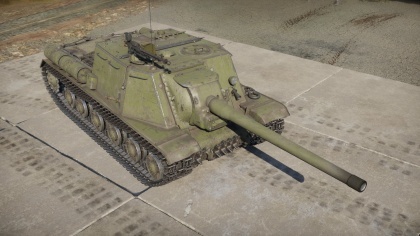 The original ISU-122 is equipped with the 122 mm A-19S gun, which had a firing rate of 1.5 to 2.5 shots per minute due to its manual-piston breech. An attempt to fix this was a modernized A-19 gun called the D-25. The D-25 didn't see installment onto the ISU-122 for a while due to prioritization on the IS-2 tanks, but it was available for use on self-propelled mounts after September 1944 as the D-25S. 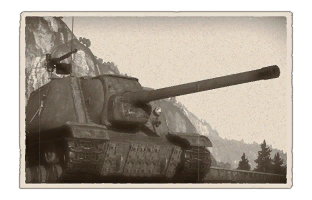 The ISU-122 prototype mounting the D-25 gun was called Object 249 which was successfully tested and an improvement over the A-19 gun with an increased firing rate of 2 to 3 shots per minute with one loader and up to 4 shots per minute with an additional loader in the crew. The D-25 also exploited the use of a muzzle brake in order to reduce the recoil forces on the gun, so the recoil buffer on the D-25 was much smaller than the A-19, which helped reduce the size of the gun and improved crew work space in the self-propelled gun. Object 249 was then adopted as the ISU-122S, which entered production side by side with the ISU-122 u and both were produced up until the end of 1945. ChKZ produced both vehicles during the war and manufactured 1,735 ISU-122s (April 1944 - December 1945) and 675 ISU-122Ss (September 1944 - December 1945). The ISU-122 were organized in units in a similar fashion as the ISU-152. Focus were made to not mix the two vehicles in the same regiments or brigades due to logistical reasons with ammunition and ballistic differences in indirect fire, but some units were equipped with both vehicles anyways. Like the ISU-152, the ISU-122 proved to be a very powerful multi-purpose vehicle as an assault gun, self-propelled artillery, and tank destroyer. The 122 mm gun on the ISU-122 allowed it to engage armour and fortifications with heavy armour-piercing round and a large high-explosive round. The primary role of the ISU-122 was as a tank destroyer due to the gun's superior ballistics compared to the ISU-152's, which large caliber size more suited its role as an assault gun. The ISU-122 did participate as an assault gun role in urban combat to support the infantry, but the lack of rotating turret, and long barrel length restricted its maneuvering and ability to engage all enemies in a large angle. Nevertheless, commanders found the ISU-122 as a very good assault gun. Usage of the ISU-122 in an indirect firing role as a howitzer is rare, but when used could fire up to 14 kilometers away. Usage as an artillery piece is more likely during a rapid offensive where towed artillery behind the lines are unable to keep up with the advancing infantry lines. Skin and Camouflages for the ISU-122 in Warthunder Live. This page was last edited on 5 April 2019, at 16:05.